The technicians at Hendersonville Muffler Company have been repairing Anti-Lock braking systems, (ABS) since they were first put on cars and truck in the 1980's. 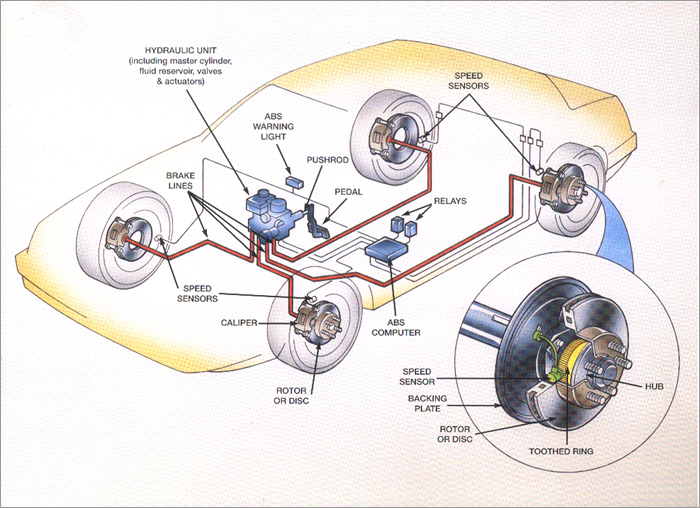 We have a great understanding of how the anti-lock braking system on your car or truck works. We know where the problems usually occur. We know how to pinpoint test the components of you anti-lock brake system instead of just guessing at what's wrong. We have also invested the latest tools and diagnostic test equipment to test your car or truck brakes. Repairing Anti-Lock braking systems is not that hard for the technicians here at Hendersonville Muffler Company. To begin with the anti-lock braking system is a normal braking system with a couple of added components for traction control. They are not really hard do diagnose. I have heard technicians telling customers that there are dozens of sensors and modules that control anti- lock braking systems. This is simply not true. All of the anti-lock brake systems work basically the same way though the individual pieces vary by manufacturer and model but all of the systems do the same job. All Anti-Lock braking systems monitor the speed of the tire rotation to detect when one or more wheels spin slower than other wheels on the car. In other words if the 2 rear wheels are going 35 mph and the front tires are going 0 mph then the system reduces the brake hydraulic pressure in the brake lines of the front wheels to allow them to spin and then increases the pressure again to allow the brakes to begin working again, (at a speed much faster than humanly possible). The repair of automotive and truck braking systems has changed as cars have become more modern. When cars were first invented they used cable operated brakes to stop. mechanics at almost any gas station or repair shop could adjust your brake cables for you because cable operated braking systems had to be repaired almost daily. It was not possible lock up the brakes in these cars even with the brakes properly adjusted. When you see old cars like this in the movies and the car is locking up the brakes the car has been retrofitted with hydraulic brakes. You could literally bend the brake pedal to the floor on a cable operated braking system and the car would not lock up the brakes! When cars and trucks started using hydraulic pressure to actuate the brakes the systems became strong enough to lock the wheel up and slide the tires. Because the brakes had to be strong enough to allow a 90 pound woman to stop a 4,000 pound car the brakes could be locked up accidentally too easily. Driving instructors taught their students to back off of the brake pedal to regain traction when the wheels started sliding and re-apply the brakes to slow the car down. This is the same thing that anti-Lock braking systems accomplish much faster. Anti-Lock braking systems are not mysterious. They are not that complicated. Anti-lock braking systems are fairly simple mechanical/ electrical systems with a fairly simple ABS control unit to monitor the wheel speed sensors and pressure output. On newer cars the ECM or PCM now gets input from the ABS system to allow the engine and transmission to help the car or truck slow down. 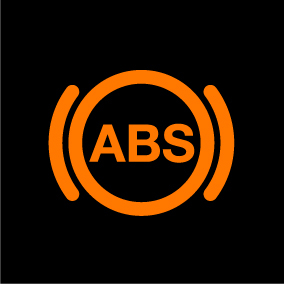 The ABS system is still a braking system so you don't want anyone working on the system who does not COMPLETELY understand it because you really do want the car to stop when needed. Hendersonville Muffler Company has the experience, the tools, and reasonable prices to repair anti-lock or conventional braking systems on cars and trucks in Sumner County, Tennessee. The technicians at Hendersonville Muffler Company are auto mechanics. We understand and repair all of the different systems in cars: electrical systems, engine repair, braking systems, suspension systems, air conditioning and climate control systems, cooling systems, and all the rest of the small components that make up your car or truck. We are full service mechanic service that can repair any problem you may have with your car or truck in the Hendersonville, Tennessee area. We have had happy customers for many years and we work hard to make sure every one of our customers is happy with their automotive repair services. Bring your car or truck into Hendersonville Muffler Company and see why we have such a great reputation for auto repairs here in Hendersonville, Tennessee.